10 oz turkey sausage, casings removed. I cooked the whole 20 oz package and used half for this recipe and then put the other half in the freezer for a future meal. 24-36 oz homemade chicken stock, or store-bought. If 24 oz makes the soup too thick for you, add more until you get to your desired consistency. 1 cup uncooked small pasta, such as seashell, but I used orzo because that was in my pantry. In a large soup pot, heat the olive oil over medium-high heat. Add the sausage and garlic and cook until sausage is no longer pink. Stir and break up the sausage into bite-sized pieces as you cook. Add the water, stock and tomato sauce and bring to a boil. Add the pasta, ¼ cup cheese, oregano, salt, pepper and beans. 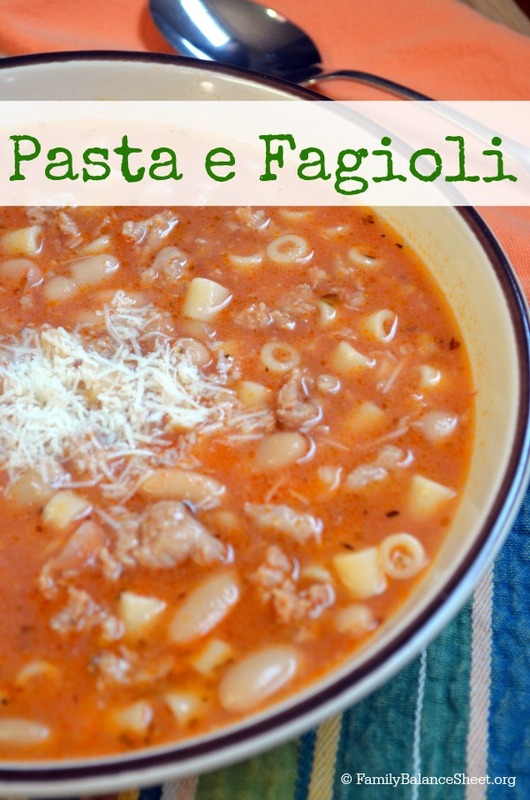 Bring to a boil and then reduce heat to a simmer for about 8 minutes until the pasta is cooked. Top with remainder of cheese to serve. Goes well with a salad, homemade applesauce and homemade bread. This looks delicious! I will have to add it to my menu for next week. Yum! Yum. That looks great for the cold weather. I have never had it with meat before – nice twist! I love soups! And yes, its always a good thing when our kids actually like what we make! 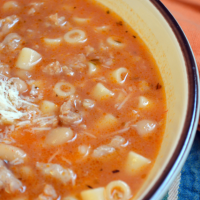 This is one of my favorite soups – and you made it look so good and simple! One of my favorites. I hope you will link it up to Crock Pot Wednesdays.